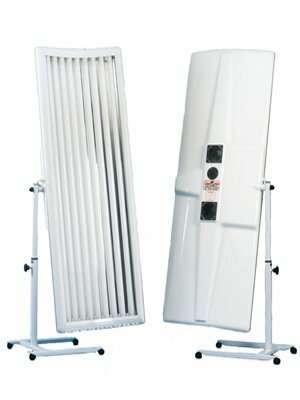 Single canopy sunbeds are an ideal entry into home sunbed tanning, they are very economical and easy to use. 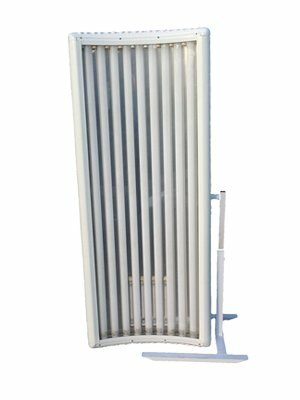 Canopy sunbeds can be used in lots of different ways due to the ease of height adjustment and the tilt and turn swivel stand. This means you can arrange the canopy sunbed over your own bed or over a chair or even a sun lounger; some people like to stand the sunbed upright and tan in that position. For sunbed home hire and rental in Birmingham please ring on 0121 222 9799 for bookings or any enquiries that you may have. We may change this policy from time to time by updating this page. You should check this page from time to time to ensure that you are happy with any changes. This policy is effective from 22nd April 2018. • we may contact you by email, phone, or mail for further clarification of requirements. We use traffic log cookies to identify which pages are being used. This helps us analyse data about web page traffic and improve the website in order to tailor it to customer needs. We only use this information for statistical analysis purposes and then the data is removed from the system. The website may contain links to other websites of interest. However, once you have used these links to leave this site, you should note that we do not have any control over that other website. Therefore, we cannot be responsible for the protection and privacy of any information which you provide whilst visiting such sites and such sites are not governed by this privacy statement. You should exercise caution and look at the privacy statement applicable to the website in question. We will not share, sell, distribute or lease any of your personal information to any third parties. You may request details of personal information which we hold about you under the Data Protection Act 1998. A small fee will be payable. If you would like a copy of the information held on you please write to: Supertan Sunbeds Ltd Unit 2 Westland Court LS11 5ST. If you believe that any information we are holding on you is incorrect or incomplete, please write to or email us as soon as possible, at the above address. We will then correct any information that is found found to be incorrect.